Our last class this year will be this Monday (22nd December). We are back again in 2015 starting on Monday the 5th of January. Come along and work off all the Christmas Pudding and New Year hangovers! Last week's jo dori class at the Hartland Club was hugely enjoyable and very instructive. It was taught by Sensei Richard Small, our chief weapons instructor, who also teaches Iwama-style weapons at his own class each Wednesday in Bideford. And here is a group photo. 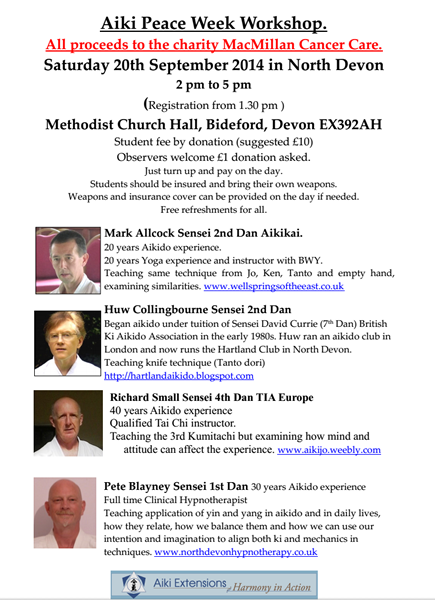 If you want to learn more about Aikido weapons (and freehand techniques), you will be very welcome to join us at the Hartland Club or in Sensei Small's Bideford Club. What are you waiting for..? Shoji Nishio Sensei - if you don't know him, you should! 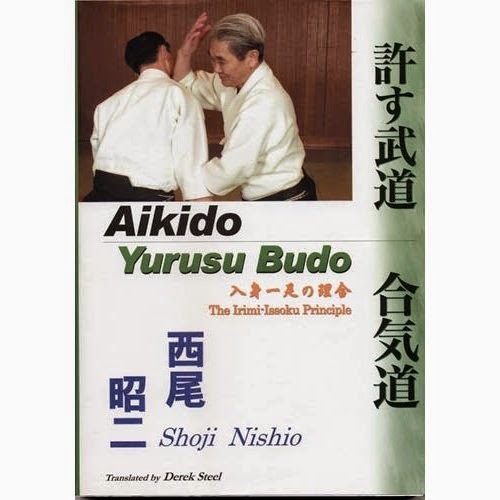 Aikido Journal has a wonderful, in-depth course taught by Nishio Sensei. If you are interested in extending your Aikido knowledge, this course is worth every penny. Nishio Sensei was a marvellously skilful teacher who specialised in blending weapons practice with open-handed technique. You can read more about Nishio Sensei HERE and you can subscribe to the Aikido Journal course HERE. Meantime, here is a short taster. What is the ‘true’ path of Aikido? 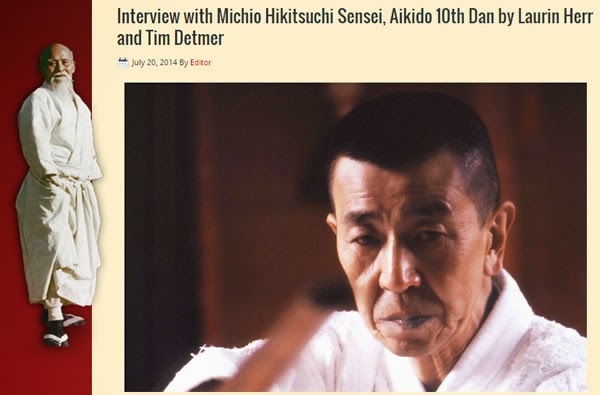 Did O-Sensei define all of Aikido from A to Z for all time? If that is the case, are we wrong to practise techniques in ways that were not precisely defined by O-Sensei? I know that many people feel that only by performing each technique in a precisely defined manner are we being ‘true’ to Aikido. But there is an alternative point of view which sees the practice of Aikido as a process of constant discovery: since no person and no attack can ever be quite the same as any other person or any other attack, each defence may change subtly in response to (or ‘in harmony with’) each attack. While both arguments have merit I must admit that personally I feel more inclined towards the latter point of view. But am I right? After all, by allowing techniques to change don’t we risk straying away from the heart of Aikido and just ‘making it up as we go along’? Should we not then accept the views of these two great masters? They considered it important to transmit faithfully the unmodified practice of Aikido just as they were taught it by the Founder. So are we to regard it as fundamentally wrong, decadent even, to introduce any changes to that purest form of our art? This reminded me of a story Koichi Tohei Sensei tells in his book “Ki In Daily Life”. One of his students, a man who had only recently been graded to 1st dan, had moved to the island of Guam. At that time there was no Aikido club on Guam and he asked Tohei Sensei how he would be able to continue his training. Tohei told him that if there was no teacher on Guam, the 1st dan must become the teacher. The man felt he was too inexperienced to do so but Tohei persuaded him that even though he only held the rank of 1st dan, he understood the guiding principles of Aikido and that was sufficient. In other words, Tohei was saying that the principles are more important than the precisely defined form. So what are we to make of this? Who is right: those who attempt to practise the techniques as closely as possible to the way they were taught by the Founder? Or those accept the principles but allow themselves great freedom in changing and developing the techniques? In my view, this apparent conflict of ideas is false. It is simply the case that some people find it more satisfactory – more personally fulfilling – to practise and perfect what they might regard as the ‘canonical form’ of Aikido while others find equal fulfilment in experimentation, adaptation and evolution. And as Aikido is, for each practitioner, a personal journey, what is right for one person may by no means by right for all others. If you want to learn Aikido and you live in North Devon or Cornwall, this is your perfect opportunity. 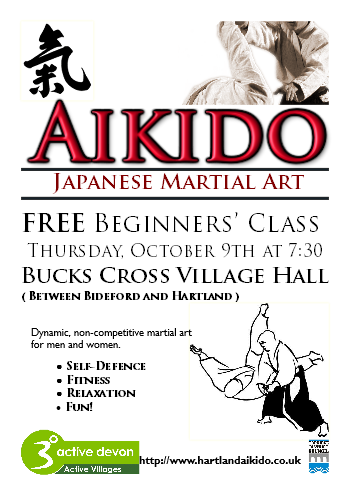 The Hartland Aikido Club will have a special free class for beginners on Thursday October the 9th from 7:30 to 9:30. The class will take place in the Bucks Cross Village Hall. If you want to learn the basics of Aikido, please come along and join us. You don't need any special clothing at first (something loose-fitting such as a track suit or a tee-shirt and casual trousers will be fine). There will be more experienced students to help out but this class is mainly aimed at helping complete newcomers to understand the basics. By the way, if you live in the area and you can display a small poster (or you know of somewhere that will display a poster), I'd be very grateful if you could download and print a PDF version of our poster HERE. From now on, the Hartland Aikido Club will meet every Monday and Thursday, week in, week out. In the past we have swapped the first Monday of each month for a Tuesday due to the Bucks Cross hall being used for other events. No longer. From Monday 1st of September we shall practise every Monday without fail. This has the advantage of simplicity - you know that we'll be there every week on exactly the same days. Sadly it also means that Sensei Small's monthly weapons classes have to be cancelled for the time being as he cannot make it on a Monday. We'll try to arrange some more 'special' classes with Sensei Small soon. In the meantime, bear in mind that Sensei Small runs his own weapons-based classes every Wednesday in Bideford. So if you want to master Aikido weapons, that is the place to go! If you are interested in Aikido and you can make it to Bideford, North Devon, this September (Saturday, the 20th), please come along and support the Aiki Peace Week Workshop in support of Macmillian Cancer Care. There will be four teachers (maybe more) and the topics taught will cover everything from ken and jo to knife defences and the application of yin and yang in Aikido and Daily Life. Everyone is welcome, no matter what style or school of Aikido you follow. The poster is shown below. For up to date information, be sure to visit Sensei Small's Bideford Aiki-jo site which carries all the latest details of this event. 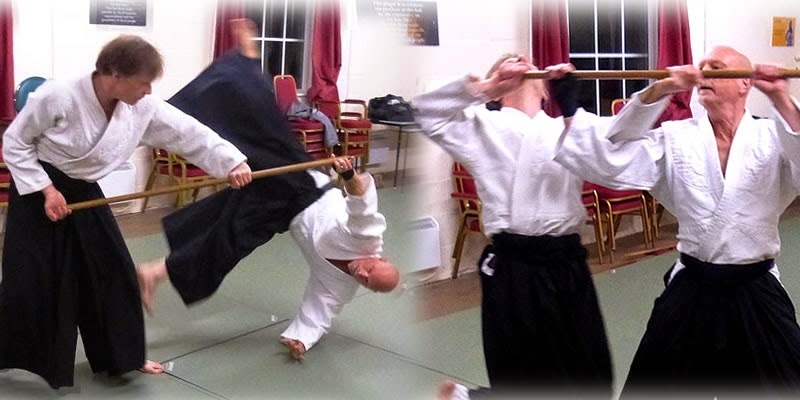 A reminder that there is no class this Monday (as it's the first Monday of the month), but once again we have a special Aiki-weapons workshop with Sensei Small at 7:30 on Tuesday (everyone welcome - please bring bokken and jo). Also, Sensei Small's Bideford Aiki-jo web site now has some advance information on the special Aiki-Peace-Week event which takes place on the 20th of September. To keep up to date with this (and other) forthcoming events, be sure to visit Sensei Small's Events page. Is it Magic, or is it Aikido? Derren Brown is a man who meddles with people's minds. In one of his TV shows he apparently made a young woman 'unliftable'. Well, so it seems. In Ki Aikido we have a number of training exercises in which we too become seemingly unliftable. In the 19th Century a certain lady who went by the name of Annie May Abbott, but was more popularly known as the “Georgia Magnet” performed a series of amazing stunts in music halls which included, among other things, her 'supernatural' ability to increase her weight at will so that strong men could not lift her. Now whether the Georgia Magnet was using the same method as Derren Brown and whether either of them used the same method as we use in Aikido I cannot say. All I can say for sure is that, by mastering a few arts of relaxation and body control, almost anyone could create the same effect. 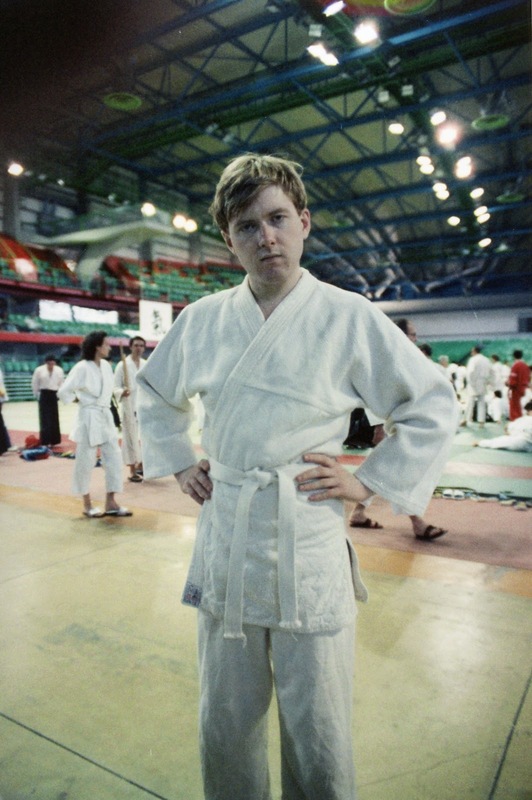 Just a reminder that there is no aikido class on Monday (7th July) but Sensei Small will be teaching an aiki-weapons class on Tuesday (8th July) at 7:30. Yes, yes, I know that Aikido is the art of peace and that we strive to find harmony and gentleness in our technique. But that is only part of the story. Aikido is also a practical method of self-defence. 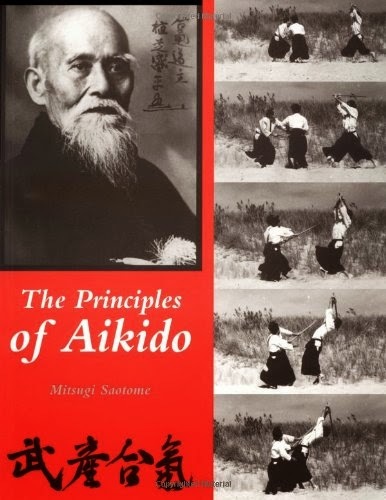 In fact, my favourite Aikido book, written in the early '60s by Koichi Tohei under the supervision of the Founder, Morihei Ueshiba, is called "Aikido, The Co-ordination of Mind and Body for Self-defense". In my view, you can only fully understand Aikido if you study both the mental and the physical aspects, the soft and the hard. I came across this video made by a Czech Aikido club this week, emphasising the self-defence aspect of Aikido. What do you think...? 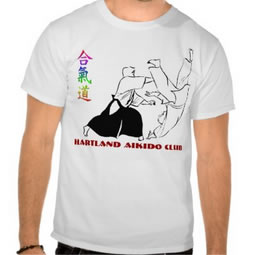 Our Three Aikido Instructors - get to know the Hartland Aikido Club! 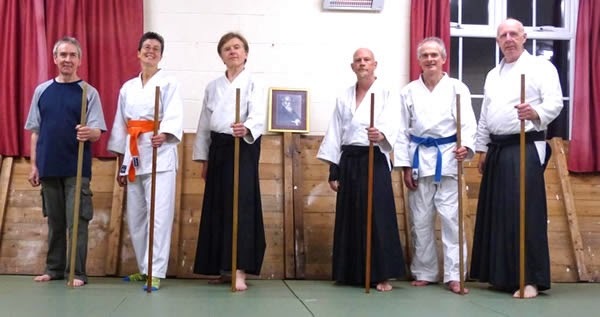 We may be a tiny club in a remote area of North Devon, but even so the Hartland Aikido Club can offer students a much broader range of Aikido teaching than many big city-based clubs. How come? Well, it turns out that we have no less than three black-belt instructors who have been practising Aikido since the '70s and '80s. What's more, the instructors have experience of a very varied range of Aikido 'styles'. 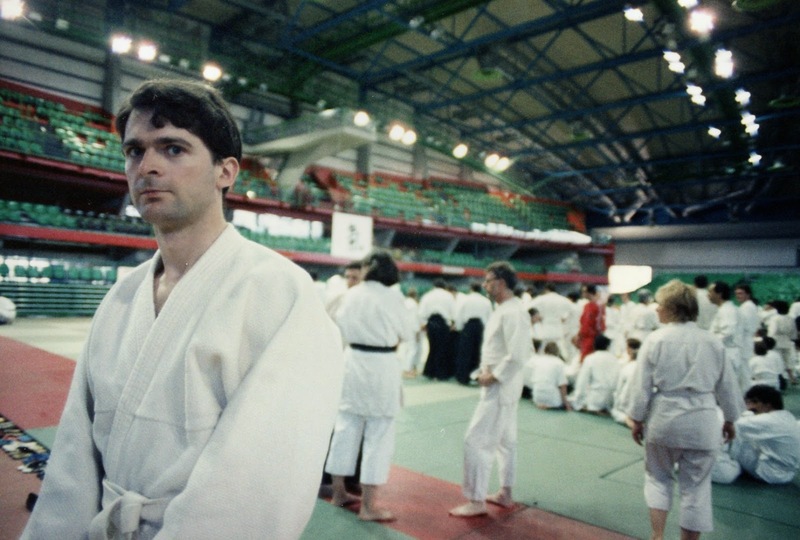 Huw Collingbourne has been taught principally in the 'Ki Aikido' style which incorporates numerous 'Ki exercises' to cultivate calmness under pressure (both in and out of the dojo). Pete Blayney has practised with many different clubs and teachers and he brings to the Hartland Club a vast knowledge of practical self-defence techniques and skills. Finally, Richard Small is an expert in weapons (jo and bokken) as taught by the 'Iwama' school of Aikido. For more information see the Instructors Page. Whether you are new to Aikido or an old hand you may find that the unusually wide range of skills available from the three instructors at the Hartland Club will help you either to discover Aikido for the first time or else to broaden your existing skills. Everyone who has an interest in Aikido is welcomed at the Hartland Club. Have no fear that you will be told that yours is the 'wrong' style of Aikido or that we won't practise with students from your organisation! On the contrary, it is our aim to work together and explore all aspects of this wonderful martial art. So if you are in the area, please come and join us! Just a reminder that there is no class next Monday (3rd March) but we have an extra class - the second in a series of workshops on the 31-count jo kata, taught by Sensei Richard Small - on Tuesday the 4th, at 7:30. If you want to learn this kata or deepen your understanding of it, this is a fantastic opportunity. Members of other aikido clubs (or organisations) are most welcome to join us. Congratulations to Nic Croll who took, and passed, his yellow belt grading last night. Nic has made fantastic progress in the few months he's been practising with us. Now onward to that orange belt! Not all of us in the Hartland Aikido Club (myself included!) are in the 'springtime of our youth'. But that doesn't stop us setting a pace that challenges the younger members. Some people, as they grow older, slow down, do less exercise, tell themselves they should 'take it easy' at their time of life. I tend to go to the other extreme: the older I get, the less time I have to do all the stuff I want to do, so I accelerate the pace rather than slow it down. I was interested to read this piece in The Washington Post recently, about a 70 year-old athlete and coach who seems to share my views. Joel Friel cycles for about two hours a day and also does weightlifting and plays golf. His activities are significantly different from mine. My exercise principally takes the form of aikido a few times a week and long walks with my dogs a few times a day. But the principle is the same: don't give give up, don't slow down. You may need to change your activities if your body can no longer cope or if you have specific health problems, but stopping them is simply not an option. "I’m highly motivated. I always enjoy going for ride, but sometimes younger athletes, although they want to, they can’t. They have so many things in their lives that interfere [such as] trying to start a career and raise a family. I’ve been through that. Now I can do things as I want to do them. That’s one of the beauties of getting older: You have much more freedom in your life. I’m taking advantage of that in every way that I can." Someone recently posted this video of Tohei Sensei showing a mix of exercises and techniques back in 1957. I thought some of you might find it interesting.